In New Brunswick, a confidence vote on the Gallant government will occur on Friday November 2nd. The sitting will begin at 9 am. By convention, the Premier concludes the debate on the Address in Reply; however, this is not a rule. Any member who has not spoken to the sub-amendment can still speak, although the Speaker is obliged to interrupt debate at 1:30 pm. on Friday and put all questions to a vote. At the time of the writing, all three Green MLAs have indicated they would vote to support the government, whereas all three People’s Alliance have indicated they would vote to defeat the government. In practice this means that the Gallant Government likely will fall on a 25 – 23 vote when the Liberal and Progressive Conservative votes are added. Due to procedural irregularities, there will be, in fact, three separate votes on the Address in Reply to the Speech from the Throne. In order, there votes will be on the sub-amendment, amendment, and, lastly, the actual motion for the Address in Reply. The respective votes will be outlined below. Lieutenant-Governor of the Province of New Brunswick. May It Please Your Honour: We, Her Majesty’s most dutiful and loyal subjects of the Legislative Assembly of the Province of New Brunswick, now in session, beg leave to extend our humble thanks to Your Honour for the gracious speech which Your Honour has addressed to us, and we assure Your Honour that all matters which may be submitted to us during the session will receive our most careful attention and consideration. In a majority parliament, the Address in Reply is almost a foregone conclusion. It provides MLAs an opportunity to discuss the government’s priorities, criticize the government’s perceived lack of priorities or, more locally, it provides MLAs an opportunity to talk about their constituencies. A defeat on the actual unamended Address in Reply can be viewed as a matter of confidence. However, in practice, the Legislative Assembly is simply refusing to send a message to the Lieutenant-Governor creating a degree of ambiguity. An explicit amendment of non-confidence adds absolute clarity to the Lieutenant-Governor that her first minister no longer has the confidence of the Assembly. It is important to comment on an aspect of parliamentary procedure. In order for an item to be ruled out of order, a point of order must be raised by an MLA and the specific rationale must be motivated. In this specific situation, the opposition erred by asking the Speaker to rule on whether the motion constitutes a question of confidence. Parliamentary tradition is clear that it is not up to Speakers to determine what constitutes a question of confidence. If the Gallant Government Survives the Confidence Vote. If the Gallant Government survives the confidence vote, then it would no longer need to abide by the caretaker principle of restraint under which it has operated since the dissolution of the previous legislature in August. The government would then be able to make substantive policy decisions and engage in any activities that require collective cabinet action, such as appointments. The next time a question of confidence could be raised would be via an Opposition Members’ Business Day on a Thursday. Similarly, the votes on capital budget and estimates in November-December would also constitute matters of confidence. If the Gallant government suffers defeat in either of these two situations and Gallant advised dissolution in response, the Lieutenant-Governor would still retain the discretion to refuse Gallant’s advice and invite Blaine Higgs to form a new government. Contrary to the scholarly narrative which has popped up over the last decade, the duration of the legislature does not in and of itself determine whether the Governor would consent to dissolve it. What matters is whether an alternative government could be formed from within the existing elected assembly or not. This “rule” that if the legislature lives at least six months, then the Governor would automatically agree to the incumbent Premier’s advise to dissolve it is a myth. However, the Lieutenant-Governor does have to consider whether there is a sufficient change in the dynamics of the politics of New Brunswick to warrant a dissolution. If the Gallant Government is defeated on a non-confidence motion, Premier Gallant would be obliged to meet Lieutenant-Governor Jocelyne Roy-Vienneau at Government House and tender his resignation. If he instead advises the Lieutenant-Governor to dissolve the current legislature, Her Honour would likely refuse to do so and thereby dismiss him from office. The Lieutenant-Governor would instead call upon Blaine Higgs to become the Premier-designate. Due factors related to the machinery of government, it is highly unlikely that Higgs would be officially sworn in as Premier on Friday November 2nd. But the transition will happen over a matter of days, and Higgs has already indicated that he would prefer a short transition of power between governments. What happens to the Legislative Assembly? A change in administration does not affect the first session of the 58th Legislative Assembly. 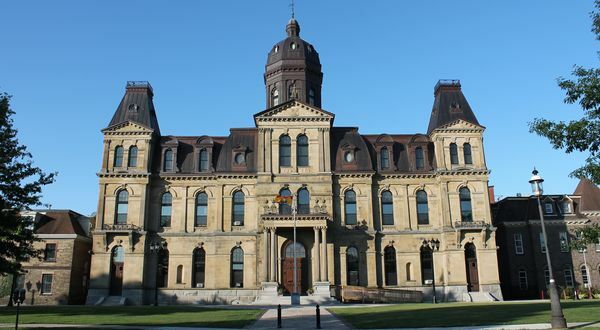 The session will continue until otherwise prorogued or dissolved by the Lieutenant Governor on the Premier’s advice. All committee compositions, sessional orders, bills, or motions on the Order Paper remain intact. Consideration of the Speech from the Throne is not a requirement due to the principal of parliamentary sovereignty. At the start of every legislative session, the assembly moves a pro forma bill indicating that it can conduct its own business independent of the Crown’s desires outlined in the Speech from the Throne. In New Brunswick, this pro forma bill is called An Act to Perpetuate a Certain Ancient Right. This parliamentary tradition, observed unfailingly since 1789, is paramount. First, Higgs will be Premier without the need for a Speech from the Throne. Presently on the Order Paper is Bill-2, An Act to Amend the Proceedings Against the Crown Act. This housekeeping bill would allow New Brunswick to enter into compliance with the Canadian Free Trade Agreement by allowing the enforcement of orders made under the agreement to internal trade. If Higgs chooses, he can pass this bill under a new administration within the present session of the legislature. Depending on consultations with the Executive Council Office, there may be other pieces of housekeeping legislation that require immediate passage but were not introduced due to the application of the caretaker convention. There are additional procedural implications if there is not a prorogation and summoning of a new session. A lasting consequence will arise if the Liberal sub-amendment is defeated. It would mean that MLAs will not be able to move motions for the remainder of the session that touch on the same subject-matter as the sub-amendment, because of the general principle that the House would have already passed judgement on the same issue. In practice, this means that a potential Liberal opposition would be unable to introduce motions calling into question why a Progressive Conservative government did not address issues related to their sub-amendment like paramedic staffing. The reason is the procedural rule called the same question, which does not allow a decision of the Assembly to be revisited in the same session. $269 Members should be extremely careful in moving amendments on the Address in Reply. If, later in the session, amendments which touch those very points on which the House has given its judgment are moved to other motions, then these new amendments should be declared out of order. Speaker Guitard would remain as Speaker until he decides to resign or is removed via a motion of non-confidence. The two Deputy Speakers who are currently members of the Liberal caucus would also remain in office until they either resign or are replaced via a new motion. The committee compositions generally respect the relative balance of the seats of the Assembly. To date, the House has not actually assigned members to committee besides the Standing Committee on Procedure, Privileges and Legislative Officers, which follows a proportional allocation of 4 Liberals, 4 Progressive Conservatives, 1 Green, and 1 MLA from the People’s Alliance. The exception to this rule would be the Legislative Administration Committee, known as LAC. This Standing Rules deem it a special committee, because it governs the internal workings of the Office of the Legislative Assembly and the Legislative Library. The rules outline its composition as 2 members of the Executive Council (cabinet) 2 members of the government backbench, 2 members for each recognized party, the 2 deputy speakers and the Speaker. Under the current composition the number of seats, it comes to 7 Liberals, 2 Progressive Conservatives, 2 People’s Alliance MLAs, and 2 Greens — meaning that the Liberals have a 7-to-6 majority on the committee. If there is a change in government, the membership would not automatically shift until a new motion is passed. If the Liberal Speaker and Deputy Speakers remain under a Higgs government, the balance would be 4 PCs, 5 Liberals, 2 Greens, and 2 People’s Alliance MLAs. This would afford the opposition a 9-to-4 majority on this committee. Dissolution is the last resort: the Lieutenant-Governor retains the discretion to reject a first minister’s advice to dissolve the legislature under exceptional circumstances – especially if an alternative government could be formed from within the existing assembly. Some Canadian scholars and observers over the last fourteen years have pitched this arbitrary notion that the legislature must live a minimum of 6, 12, 18, or 24 months before the Governor should grant a dissolution without question upon the advice of the incumbent Prime Minister. For example, Adam Dodek has argued that the true constitutional convention associated with minority parliaments in Canada is that the parliament must sit “for a reasonable length of time” – probably between six and twelve months – before the Governor General would accept the Prime Minister’s advice to dissolve it. The 39th Parliament lasted longer than most minority parliaments and met this test. Former Governor General Adrienne Clarkson recounted in her autobiography with respect to the 38th Parliament that “if [the Martin] government lasted six months, I would allow dissolution” — meaning that if the Martin government survived for at least six months before losing a vote of confidence, Her Excellency would have accepted Prime Minister Martin’s advice to dissolve the 38th Parliament without ascertaining whether an alternative government could be formed within the existing House of Commons. We believe that this formulation muddles and confuses the true underlying principle at play here: as a corollary to the third rule that dissolution remains the last resort, we should add that the age of the legislature is secondary — perhaps not entirely immaterial, but certainly secondary and subordinate — to the question as to whether an alternative government could be formed from within the existing assembly, which should be determinative and is the most important factor. The two questions have become muddled out of imprecision. Since we’re hopeless pedants our revel in our own pedantry, we notice these matters and would happily explain it. Oftentimes, the two questions — age of the legislature and whether an alternative government can be formed within the existing assembly — are correlated, and so the age of the legislature becomes shorthand for whether or not an early dissolution should be granted. For instance, the current case of New Brunswick 2018, Kris Austin, leader of the People’s Alliance, has indicated that his party would support a Progressive Conservative government led by Blaine Higgs case by case for 18 months. If the assembly withdrew its confidence from the Gallant government on 2 November 2018 and Higgs then became premier, and, subsequently, the People’s Alliance joined the Greens and Liberals in voting down a Higgs government in May 2020, Higgs would advice Lieutenant Governor Roy-Vienneau to dissolve the current legislature. And Her Honour would probably accept Higgs’ advice — not because of the age of the legislature — but because all potential governments have been exhausted and voted down by the elected assembly. Also, oftentimes an alternative government does not exist within a minority legislature that has lived at least 6 or 12 or 18 or whatever number of months is because the parties in opposition want an election just as much as the government does. One need look only to the federal elections of 2000 and 2011. In 2000, Stockwell Day, then Leader of the Opposition, famously dared and taunted Prime Minister Chretien to call an early election for a whole month; Chretien obliged — and the Liberals won a larger parliamentary majority. Similarly, in 2011, the three opposition parties defeated the Harper government on a question of confidence. Strictly speaking, the opposition, which outnumbered the government in that minority parliament, could have formed government without an election, but, in reality, all four parties welcomed the ensuing early election. Under our system, the government wants to remain the government, and the opposition wants to become the government. The fate of Conservative Premier Daniel Hanington’s government was decided by three of his supporters, who in a 48-hour period switched their votes to join Liberal Opposition Leader Andrew Blair in defeating the Hanington Government. Specifically, the Hanington government was defeated by an amendment to the Address in Reply on Monday, February 26, 1883. This scenario is the closest analogue to what will likely happen in New Brunswick in 2018. The announcement of the vote was received with considerable enthusiasm and Mr. Barberie was almost frantic with glee – as he tossed his hat and hurrahed wildly. The opposition members (and notably the leader) were [warmly] congratulated on having at last realized their sorely tried ambition. Premier Hanington moved a motion to adjourn the house until the subsequent day. The House then met on Wednesday, 28 February, but did not conduct any substantive business. It was only on Friday, March 2nd, that Premier Hanington announced to the Assembly that the Government resigned. The Assembly promptly then adjourned. Finally on Saturday, March 3rd, six days after the motion of non-confidence, the new President of the Executive Council, Thomas Gillespie, announced that the Lieutenant-Governor Robert Wilmot called upon Andrew Blair to form a government and already sworn him into office due to the resignation of his predecessor. In other words, the Lieutenant Governor had prorogued the legislature so that the ministerial by-elections could take place during the intersession. This avoided subjecting the new government to a defeat in the absence of all those who had been appointed to the Executive Council and thus forced to resign as MLAs. Both the precedents from Canada in 1873 and New Brunswick in 1883 demonstrate the idiosyncrasies and pitfalls of ministerial by-elections and how they affect a ministry’s standing within the elected assembly. When the Prime Minister appointed an elected MP to the Privy Council (a position of emolument under the Crown), the new Minister had to resign and run for re-election in a by-election before being sworn in to cabinet. The Province and Dominion of Canada had adopted this principle from the United Kingdom. The Westminster Parliament first mandated ministerial by-elections during the reign of Queen Anne, well before modern cabinet government had emerged in the United Kingdom and long before Responsible Government had been granted to the colonies. This procedure was seen as a means of limiting the executive’s authority to turn MPs into Crown placemen, and it was motivated by the same fears that prime ministerial patronage power elicit today. Ministerial by-elections also highlighted the separation of powers between the executive and legislature. Both the Province of Canada and the Dominion of Canada mandated ministerial by-elections in statute; the Parliament of Canada abolished the practice in 1931, following in the United Kingdom’s repeal of ministerial by-elections in 1926. The fallout of the King-Byng Affair ultimately spurred Parliament into abolishing ministerial by-elections. The House of Commons withdrew its confidence from Meighen’s government after only a few days in the absence of Meighen and his cabinet ministers, who had all vacated their seats in order to pursue re-election in by-elections. Without ministerial by-elections, the Meighen government would have commanded a larger majority and would almost certainly have survived longer than it did. In consequence of the resignation of my late Ministers during the debate on the address I have called a fresh administration to my Council. A large number of seats in the House of Commons having thus become vacant, I have decided with due regard to the circumstances of the case, that it will be most convenient in the interest of the public business to prorogue this Parliament. Lieutenant Governor Robert Wilmot did likewise, accepting the advice of the new Premier, Andrew Blair, to prorogue the legislature so that his new government did not lose its parliamentary majority for the duration of the writs of the ministerial by-elections. This is precisely what happened in the federal House of Commons in June 1926, a few days after Prime Minister Arthur Meighen and his cabinet had resigned their seats to run in ministerial by-elections. Frankly, Meighen should have prorogued! Dufferin and Wilmot readily promulgated these immediate prorogations as the only means of allowing the existing legislatures to continue. If they had not, then the new ministries would have immediately lost the confidence of the elected assembly, and, since those assemblies had already rejected one government, therefore forced early dissolutions immediately. Prorogation at least gave the existing parliaments a chance at surviving. Under these circumstances, “prorogation” truly lives up to its core etymological meaning, “to prolong” a parliament. 1. The Leader of the Liberal Party will not request a dissolution of the Legislature during the term of this agreement, except following defeat on a specifically-framed motion of non-confidence. 2. The New Democratic Party will neither move nor vote non-confidence during the term of this agreement. 3.While individual bills, including budget bills, will not be treated or designated as matters of confidence, the overall budgetary policy of the Government, including the votes on supply, will be treated as a matter of confidence. The third point sounds contradictory, but the agreement did hold for the two years that the Liberals and New Democrats had agreed. Totalling only four papers, the rest of the agreement pertains to “legislative reform”, or what we would today call democratic reform, and various aspects of social policy. Miller opted to continue as Premier and met the legislative assembly accordingly on 4 June 1985. The Journals and Debates indicate that Premier Miller nominated Liberal MPP Hugh Edighoffer as Speaker of the 33rd Legislature, which shows that Millar wanted above all to eke out maximum advantage to the Progressive Conservatives. Liberal leader David Peterson seconded the motion, and the Legislative Assembly acclaimed Edighoffer as Speaker. In those days, the Legislative Assembly did not vote for Speaker by secret ballot. But, since the Miller Conservative Government, even while borrowing frantically from the policies of other parties, has failed to provide progressive leadership for Ontario, and failed to deal with the major challenges facing the province; and since it is the responsibility of this Legislature to reflect the democratic will of the people as expressed in the election May 2, 1985, it is our duty to respectfully submit to Your Honour that Your Honour’s present Government does not have the confidence of the House. On 18 June 1985, the motions carried, and the Legislative Assembly thus withdrew its confidence from the Miller government by a vote of 72 to 52. The House then adjourned until 2 July. In my capacity as Lieutenant-Governor of Ontario and as the representative of Her Majesty the Queen in Ontario, I have this day asked Mr. David Peterson to form a government, he having assured me that he can form a government which will have the confidence of the Legislative Assembly for a reasonable length of time. On the advice of counsel with whose opinions I agree, I have advised Mr. Peterson that the agreement between the Liberal Party and the New Democratic Party, a copy of which had been delivered to me, has no legal force or effect and that it should be considered solely as a joint political statement of intent and that the agreement cannot affect or impair the powers or privileges of the Lieutenant-Governor of Ontario nor of the members of the Legislative Assembly. Lieutenant-Governor Aird swore in David Peterson as Premier on 26 June. Crucially, Speaker Edighoffer remained at his post and served for the duration of the 33rd Legislature, despite the mid-parliamentary transition of power between Miller and Peterson. Peterson also opted to continue the 1st session and therefore did not need to craft a new Speech from the Throne. For all intents and purposes, the policy initiatives contained in the supply agreement between the Liberals and New Democrats served as a legislative program. Peterson abided by the terms of the supply agreement, though he did advise an early dissolution soon after its expiration in the summer of 1987. The Lieutenant Governor granted this early dissolution in a minority legislature because it had exhausted all possible governments that could gain the support of the assembly. The Liberals went on to win a parliamentary majority in September 1987. The precedent from British Columbia in 2017 bears a striking resemblance to what happened in Ontario in 1985. British Columbians went to the polls on 9 May 2017 and elected a hung parliament, the Liberals having won a plurality of 43 seats (one short of a majority). The New Democrats won 41 seats, and the Greens hold the balance of power, with 3 seats. Undeterred, like Miller before her, Premier Clark announced on 30 May that she would remain as Premier and test the confidence of the new legislature — yet she also acknowledged that her ministry would almost certainly lose the vote of confidence on the Address in Reply to the Speech from the Throne. And eventually, of course, it did. As in New Brunswick in 2018, the precedent from British Columbia in 2017 involved much acrimony and brinkmanship on electing the Speaker for the 41st Parliament, before which the assembly could conduct no other business. Ultimately, Clark’s Liberals relented (just as Gallant’s Liberals did this year) and put forward one of their MLAs as a candidate, Steve Thomson, which left the Liberals with, in effect, 42 seats versus the New Democrats’ and Greens’ combined 44. Later that day, the motion carried on division 44 to 42. As the Lieutenant Governor of British Columbia, and as the representative of Her Majesty the Queen of Canada, I have met with Premier Clark and will accept her resignation. I have asked Mr. Horgan to form a government, he having assured me that he can form a government which will have the confidence of the Legislative Assembly. Lieutenant-Governor Guichon swore in John Horgan as Premier and the new cabinet on 18 July 2017. Unlike David Peterson in 1985, Premier Horgan opted to return to the assembly with a new session; he advised Her Honour to prorogue the 1st session of the 41st Parliament on the morning of 8 September with a pro forma closing Speech from the Throne and to open the 2nd session later that same afternoon with a Speech from the Throne. And also unlike in Ontario in 1985, the incumbent Speaker and Liberal MLA, Steve Thomson, decided to resign along with the outgoing Clark government. The Legislative Assembly acclaimed Liberal MLA Darryl Plecas as the new Speaker just before the Lieutenant Governor’s prorogation speech. The Liberals later kicked him out of the parliamentary party. These four precedents provide a good array of possible avenues that New Brunswick’s Legislative Assembly could take on 2 November 2018 and in the following days thereafter if the Gallant government loses the vote of confidence. New governments which come into office after a mid-parliamentary transition of power can choose to continue with the previous legislative session, as Peterson did, or they can opt to prorogue the previous session and start fresh with their own Speech from the Throne, as Horgan did, or advise an early dissolution, as Mackenzie did. In this era of strong party discipline, governments which come to power during a minority parliament should also make public, and thus known to the Governor, any relevant supply agreements. David Peterson’s Liberals and Bob Rae’s New Democrats struck a supply agreement for a period of two years in Ontario back in 1985, and John Horgan’s New Democrat’s and Andrew Weaver’s Greens came to a similar supply agreement in British Columbia in 2017 that would carry through the entire life of the legislature. The practice of ministerial by-elections in New Brunswick was abolished in 1927. This means that if the Lieutenant-Governor asks Higgs to form a new Administration, he will be able to appoint ministers with portfolios without it affecting his ability to command the confidence of the assembly in the short term. This also enables him to immediately implement his own legislative agenda without the need for a Speech from the Throne. Kris Austin, Leader of the People’s Alliance, has already stated publicly that his party of 3 MLAs would support a Progressive Conservative government led by Blaine Higgs “bill by bill”, depending on the issue, for at least 18 months. Ad hoc government is not ideal. It would be preferable if the Progressive Conservatives and People’s Alliance followed the precedents from Ontario and British Columbia, crafted a formal supply agreement, and then made it public. That much is certainly in the public interest of the New Brunswick. If they so wished, they could even form a proper coalition government where both parties hold representation in cabinet, as Roy Romanow’s New Democrats did with Jim Melenchuk’s Liberals in Saskatchewan between 1999 and 2001. That said, supply agreements do tend to work out better for the smaller party than does entering into cabinet; the provincial Liberals in Saskatchewan haven’t been seen since that coalition government collapsed in 2001. We shall watch tomorrow’s vote with great interest and soon write the history of the fifth precedent! Jacques Poitras, “Gallant Liberals Poised to Lose Confidence Vote Friday,” CBC News, 1 November 2018. New Brunswick, Legislative Assembly, Excerpt, 59th Legislature, 1st Session, Daily Sitting 3, 24 October 2018. New Brunswick, Legislative Assembly, Excerpt, 59th Legislature, 1st Session, Daily Sitting 5, 30 October 2018. Jacques Poitras, “Higgs Says that He Wants ‘Faster Than Normal’ Transition If Given Chance to Govern,” CBC News, 10 October 2018. Liberal MLA the Hon. Lisa Harris quoted from Beauchesne in New Brunswick, Legislative Assembly, Excerpt, 59th Legislature, 1st Session, Daily Sitting 5, 30 October 2018. James W.J. Bowden, “Reining in the Crown’s Authority Over Dissolution: Canada’s Fixed-Date Election Laws versus the Fixed-Term Parliaments Act of the United Kingdom.” M.A. Thesis, Carleton University, 2018. Adam Dodek, “The Past, Present, and Future of Fixed Election Dates in Canada,” Journal of Parliamentary and Political Law 4 (2010): 227. Adrienne Clarkson, Heart Matters (Toronto: Viking Canada, 2006), 192. James W.J. Bowden, “Reining in the Crown’s Authority Over Dissolution: Canada’s Fixed-Date Election Laws versus the Fixed-Term Parliaments Act of the United Kingdom,” M.A. Thesis, Carleton University, 2018. The Honourable Michael Ignatieff in [Business of Supply: Opposition Motion – Confidence in the Government”] in Canada, House of Commons, Hansard (Debates), 40th Parliament, 3rd Session, volume 145, no. 149, 25 March 2011, 9246. James W.J. Bowden, “Canada’s Legal-Constitutional Continuity, 1791-1867,” Journal of Parliamentary and Political Law 13, no. 1 (2019): forthcoming. Martin Pugh, “‘Queen Anne Is Dead’: The Abolition of Ministerial By-Elections, 1867-1926,” Parliamentary History 21, no. 3 (2002): 351-366. 21-22 George V, chapter 52: An Act to remove the necessity of re-election of Members of the House of Commons of Canada on acceptance of office, 1931. Canada, House of Commons, Debates, 2nd Parliament, 2nd session, Volume VIII, 7 November 1873 (Ottawa: House of Commons, Reconstructed 2013), 175. Peter Neary, “The Morning After a General Election: A Vice-Regal Perspective,” Canadian Parliamentary Review 35, no. 3 (Autumn 2012): 27. David Peterson and Bob Rae, “An Agenda for Reform: Proposal for a Minority Parliament, May, 1985,” 28 May 1985. Ontario, Legislative Assembly, Journals, 33rd Legislature, 1st Session, Volume CXIC, 4 June 1985, 5-6. Ontario, Legislative Assembly, Journals, 33rd Legislature, 1st Session, Volume CXIC, 7 June 1985, 27. Ontario, Legislative Assembly, Journals, 33rd Legislature, 1st Session, Volume CXIC, 18 June 1985, 39. Justin McElroy, “BC Green Party Agrees to Support the NDP in the Legislature,” CBC News, 29 May 2017. John Horgan and Andrew Weaver, ““2017 Confidence and Supply Agreement between the BC Green Caucus and the BC New Democrat Caucus,” 29 May 2017. Justin McElroy, “Christie Clark to Stay on BC Premier — for Now,” CBC News, 30 May 2017. British Columbia, Legislative Assembly, Official Report of Debates (Hansard), 41st Parliament, 1st Session, Issue 1, Morning Sitting (22 June 2017), 1-2. British Columbia, Legislative Assembly, Orders of the Day, No. 7, 41st Legislature, 1st Session (29 June 2017) (John Horgan). British Columbia, Legislative Assembly, Debates of the Legislative Assembly (Hansard) 41st Legislature, 1st Session (29 June 2017), at 1720. Justin McElroy & Richard Zussman, “Showdown at Government House: The Meeting That Ended 16 Years of BC Liberal Rule — Why Lieutenant Governor Guichon Rejected Premier Christy Clark’s Advice and Allowed the NDP to Form Government,” CBC News, 30 June 2017. CBC News, “BC’s New NDP Government Sworn Into Office,” 18 July 2017. British Columbia, Legislative Assembly, Debates of the Legislative Assembly (Hansard) 41st Legislature, 1st Session, No. 10 (8 September 2017), 243-244; British Columbia, Legislative Assembly, Debates of the Legislative Assembly (Hansard) 41st Parliament, 2nd Session, No. 1 (8 September 2017), 245-248. British Columbia, Legislative Assembly, Debates of the Legislative Assembly (Hansard) 41st Legislature, 1st Session, No. 10 (8 September 2017), 243. CBC News, “People’s Alliance Agrees to Support a PC Government in New Brunswick ‘Bill by Bill,’” 28 September 2018. Saskatchewan, Government of Saskatchewan News and Media, “Premier Romanow Press Conference with the Hon. Jim Melenchuk,” 30 September 1999. As Romanow said, “NDP and Liberal MLAs will continue to sit in the Legislature as separate, duly elected caucuses. We will work together in a joint coalition Cabinet — FULL PARTNERS in managing the Government.” CBC News, “Saskatchewan’s Former Coalition Government Remembered,” 2 December 2008. This entry was posted in Crown (Powers and Office), Dissolution, Formation of Governments. Bookmark the permalink.